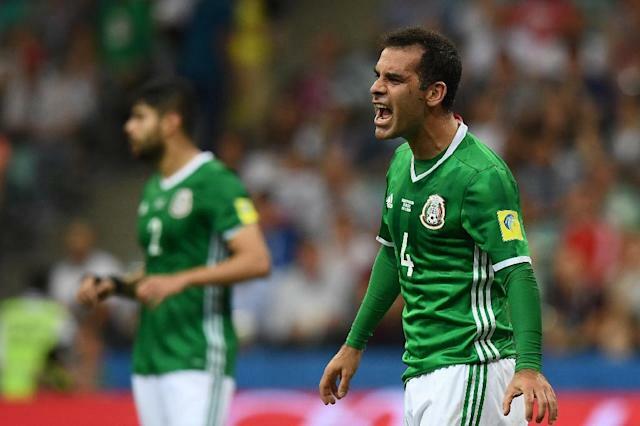 Washington (AFP) - The US Treasury on Wednesday accused Rafael Marquez, captain of Mexico's national football team and a former FC Barcelona player, of being a "front person" for a major drug trafficking organization. Marquez, who has captained his team a record four times in the World Cup, was one of 22 people and 43 entities the US Treasury placed on a sanctions list in relation to a Guadalajara-based drug trafficking group controlled by businessman Raul Flores Hernandez. The Treasury said Marquez has a "longstanding relationship" with Flores, has acted as a "front person" for him and held assets on his drug cartel's behalf. It said Flores, who was indicted in Washington, DC and California in March on charges of cocaine trafficking, flew under the radar for years by operating in strategic alliances with the heads of the more notorious Sinaloa cartel and another, the Jalisco New Generation cartel. Marquez, who voluntarily reported to the Mexican Justice Ministry, denied any involvement. "I categorically deny any type of relationship with said organization and the referred events," the football star said in a statement. John Smith, head of the US Treasury's Office of Foreign Assets Control which implements sanctions, said that Flores "has operated for decades because of his longstanding relationships with other drug cartels and his use of financial front persons to mask his investments of illegal drug proceeds." Also named on the blacklist Wednesday under Washington's "Kingpin Act" were Flores and members of his family, business associates, and Latin Grammy-nominated singer Julion Alvarez. The sanctions freeze any assets, such as bank accounts and property, that a blacklisted person holds in a US jurisdiction, and bans any US individuals or companies from doing business with them. Mexican authorities, who said that Flores was captured in Mexico on July 20, took actions to seize assets linked to the group. US authorities said Flores controls a casino, restaurants, bars, a shipping company and a music production company, mostly based in Jalisco state. The US announcement rocked the Mexican football world where Marquez, popularly known as Rafa, is a legend at 38 after making his debut for the national team in February 1997 and then leading the team in the last four World Cups. He was a young star for the Atlas club before moving to AC Monaco in 1999. Four years later he signed with FC Barcelona, becoming the first Mexican player to win a Champions League final with the team's victory over Arsenal in 2006. The defender spent another four injury-marred years with the team before being released in 2010. After that he spent two years with the Red Bulls of US Major League Soccer, and then joined Mexico's Club Leon, and most recently played for Atlas again. Still potent, he scored the winning goal at the 89th minute in a 2-1 World Cup qualifier victory over the United States last November. Mexico's football federation had no comment on the US accusations. "I never have participated in any of these organizations that have been mentioned," Marquez said in a message to reporters from Club Atlas. "As I have faced my career as a professional, today is my most difficult match, and I will try to clarify all this as soon as possible," he said. The US statement gave no details on his alleged actions on behalf of Flores. But also blacklisted were Mauricio Heredia Horner, the chief executive of Marquez's charity foundation, according to its Facebook page. In addition, a mariachi singer, Marco Fregoso, was also on the sanctions list as someone who had acted on behalf of Marquez for the Flores organization. Singer Alvarez, a star of the popular norteno style of music, said in a televised statement that there was nothing to the reports. "Nothing has happened. I just have to check where the accusations have come from. I dedicate myself to music. Thank God I don't have to do the kind of thing they have accused me of," he said. He added that he was "great friends" with Marquez. "Would you believe that he needs to do such things?" he said.